NEED CUSTOM ROLLS? No Problem. Why buy new rubber rolls when you can recover and refurbish your rolls at a fraction of the cost? 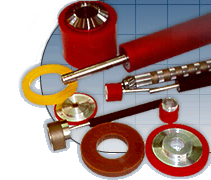 Here at Precision Roll, we specialize in custom urethane and silicone rubber roller recovering. We offer services not available from most equipment manufacturers. We can custom cover or manufacture rolls and wheels for any kind of application. Contact Us Today!